Ah, 502 Restaurant Week… Dinner at Rye proved to be amazing. While we didn’t stick to ordering the three course prix fixe menu they had available, we still ended up with some pretty tasty dishes. We split their fries- one of Bryan’s favorites, thick cut and served with a garlic aioli- and a spicy butternut squash gratin. I’m a nut for anything butternut squash. Our entrees were as opposite as they could be. Bryan got a super manly steak, seared and served on a bed of mustard based sauce and covered in grilled mushrooms and an au jus. He was in Heaven. As for me, a recent lover of beets (I was exposed to only pickled or canned beets as a kid. 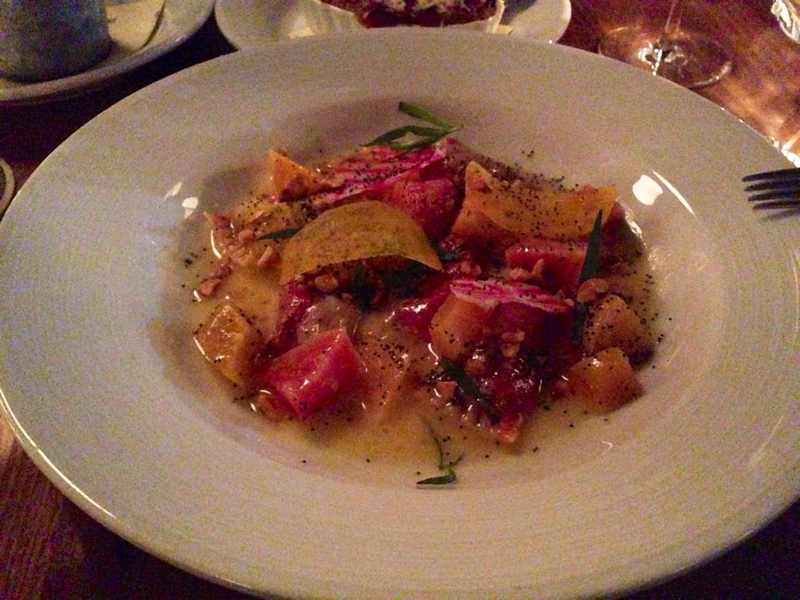 Not a fan), the beet agnolotti jumped off the menu at me. A handmade agnolotti stuffed with a mixture of red beet purée and sweet mascarpone cheese, situated among roasted golden and candy cane beets and a light butter sauce, with cracked poppy seeds and tarragon. A glass of Pinot Noir was the perfect side. Afterwards, we walked down to our beloved La Coop for dessert, chatted with Chef Bobby and enjoyed French Press. We were home and in bed by 11:30 on a Saturday night. On a Saturday! I’m sure that means we’ve entered adulthood. Before bed that night, I started thinking of how I could recreate that beet dish. I have to plan it for the garden this summer- the sauce was so light and buttery that I could have seen it as a warm-weeather dish. I haven’t handmade pasta in years, but I think this would be the perfect meal for dinner in the garden, with candles and a large carafe of that Pinot noir.